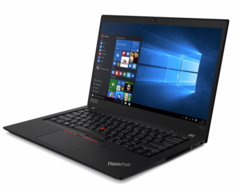 Our test model of the new Lenovo ThinkPad T490s carries the designation 20NYS02A00 and is currently the smaller choice of the two Campus models. Lenovo now uses the Core i5-8265U from the Whiskey Lake generation, even though the chip (both CPU and iGPU) is just slightly faster than the predecessor. You also get a 512 GB NVMe-SSD as well as 16 GB RAM on-board. The choice of display is very interesting, because we get the new 1080p low power IPS display with an advertised luminance of 400 nits. Assuming this is supported by our measurements, Lenovo could have fixed one big issue we had with the previous model. We will obviously check the display as well as the effect on the battery runtime. The Campus model retails for 1259 Euros (without Windows). 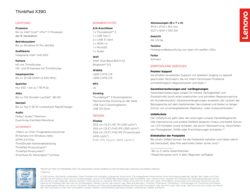 A comparable model in Lenovo's online shop costs more than 1900 Euros, but with Windows 10 Home and integrated LTE. The LTE module is currently mandatory when you select the 400-nit 1080p screen. We have no information about Topseller units (pre-configured models for all customers) at this time. 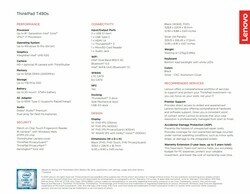 There is currently only one Campus configuration of the new ThinkPad X390 (20Q1S02M00) for 1159 Euros. You get a Whiskey Lake Core i5-8265U, 512 GB NVMe SSD storage as well as 16 GB RAM, which is also on-board similar to the bigger T490s. The display selection is more limited. Lenovo unfortunately offers a HD TN panel (250 nits) for the X390, which should be avoided. 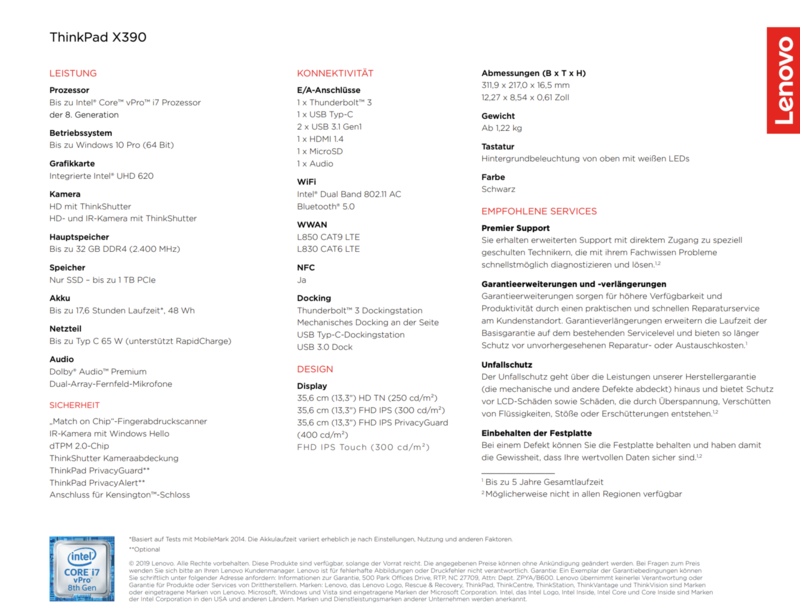 Interestingly, it appears Lenovo thinks that as well, because even the cheapest model in the German online shop is pre-configured with the 1080p IPS screen. You can only select the downgrade to the HD TN panel when you customize the unit. The FHD screen is advertised at 300 nits and is the screen of our review unit. There is an optional 400-nit panel with an integrated privacy filter (PrivacyGuard), which is comparable to HP's SureView function. The last option is a touchscreen with 300 nits. The PrivacyGuard panel is currently not yet available. A comparable unit in Lenovo's online shop with Windows 10 Home costs almost 1500 Euros. It will take a while before out full reviews of the two new ThinkPads will be online. We are eager to check the new low power Full HD screen of the ThinkPad T490s, so we will publish our first impressions as soon as possible. We will also inform you if there are any interesting developments during our review period. We would also like to answer questions you might have. All you need to do is leave a comment.